We Consider Ourselves to Supply the Best of Quality and to Meet the Highest Health and Environmental Standards. We show our customers the solutions we can develop together to live up to our responsibility for sustainability and resource conservation.We consider ourselves to supply the best of quality and to meet the highest health and environmental standards at the same time. TUNAP is one of the largest European manufacturers of aerosols and innovation leader in many areas. For the industry since the 70s TUNAP is a reliable and competent partner in the field of fats, oils and pastes. TUNAP has been playing a pioneering role for decades in products for automotive garages and is also the technology leader in chemical-technical systems for fuel system cleaning. 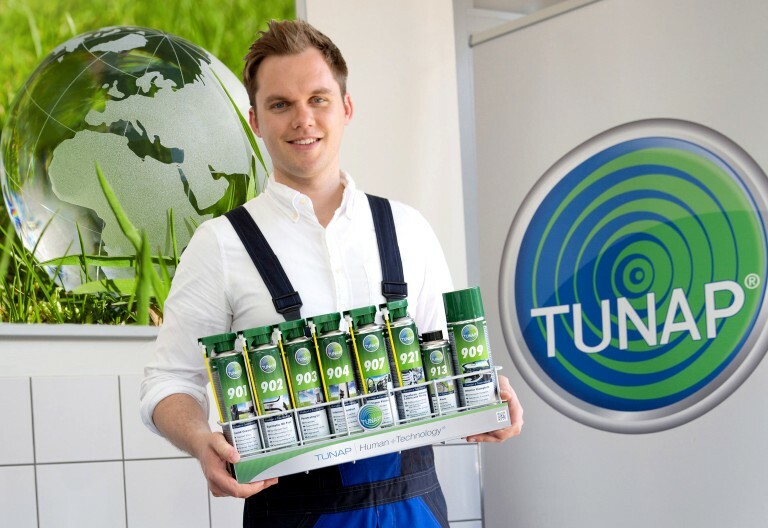 2006 TUNAP presented with the product TUNSolve® the first safety cleaner, which was developed together with independent key institutions such as the safety committee of the employer´s liability insurance association and TÜV Süd. With its patented air-conditioning cleaning system TUNAP offers the only solution which is recommended by ECARF and the the German Allergy and Asthma Association (daab). Whether it is cleaning, care, protection or lubrication: TUNAP can supply the entire system needed from active concentrated agent to finished aerosol. Always with the concept of supplying individual services, chemical and cosmetic products of the very highest quality. TUNAP can supply seamless overall consulting ranging from financial advice via technical product training to responsible handling of chemicals.